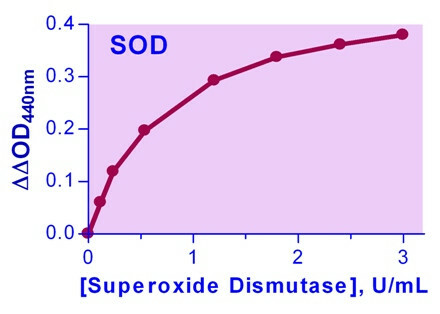 For quantitative determination of superoxide dismutase (SOD) enzyme activity. Superoxide dismutases (SOD, EC1.15.1.1) are enzymes that catalyze the dismutation of superoxide into O2 and H2O2. They are an important antioxidant defense in all cells exposed to O2. There are three major families of superoxide dismutase: Cu/Zn, Fe/Mn, and the Ni type. Aberrant SOD activities have been linked to diseases such as amyotrophic lateral sclerosis, perinatal lethality, neural disorders and cancer. BioAssay Systems’ SOD assay provides a convenient colorimetric means for the quantitative determination of SOD enzyme activity in biological samples. In the assay, superoxide (O2-) is provided by xanthine oxidase (XO) catalyzed reaction. O2- reacts with a WST-1 dye to form a colored product. SOD scavenges the O2- thus less O2- is available for the chromogenic reaction. The color intensity (OD440nm) is used to determine the SOD activity in a sample. 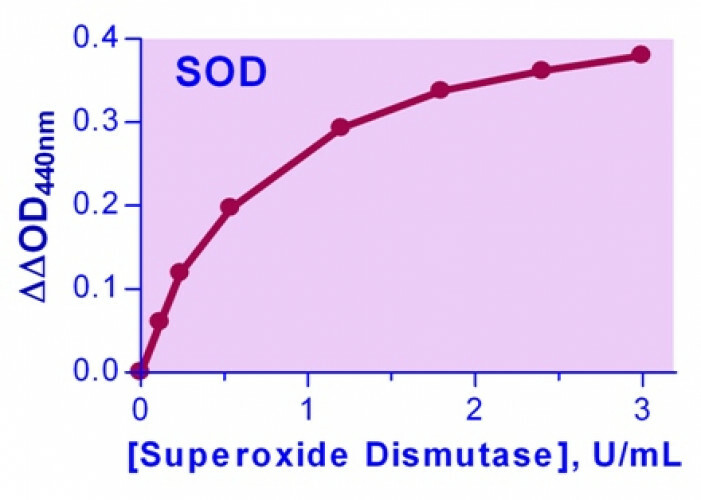 Applications For quantitative determination of superoxide dismutase (SOD) enzyme activity. References Assay: Superoxide Dismutase in Fish plasma (Pubmed).